Kathryn's Report: Boeing, Airbus to Lose Billions in Orders From Trump’s Iran Sanctions: Boeing and Airbus signed more than $40 billion in combined deals after sanctions were lifted in 2016. These orders now stand to be voided. Boeing, Airbus to Lose Billions in Orders From Trump’s Iran Sanctions: Boeing and Airbus signed more than $40 billion in combined deals after sanctions were lifted in 2016. These orders now stand to be voided. The world’s largest plane makers were the biggest and earliest beneficiaries of the Obama administration’s detente with Iran. President Donald Trump’s decision to walk away from the deal could leave them the first and hardest hit. Boeing Company, the world’s largest plane maker, and European rival Airbus SE signed more than $40 billion in combined plane deals with Iranian carriers after the U.S. and five other world powers lifted sanctions in return for Tehran agreeing to curb its nuclear ambitions. Those orders stand to be voided after the White House said it would rescind licenses for plane exports to Iran, following President Trump’s decision Tuesday to pull the U.S. out of what he called a “one sided” nuclear deal. The fortunes of Boeing and Airbus are closely linked to far bigger markets in the U.S., Europe and Asia, but Iran has long presented an attractive growth market, because of the country’s old fleet of planes and large population eager to travel. Iranian officials have suggested the country could need 400 planes or more over the next decade, making it potentially one of the world’s biggest airplane growth markets. Iranian airlines that were stuck with some of the world’s oldest fleets after years of being blocked from buying new planes were looking to introduce new western jets to revive their fortunes. 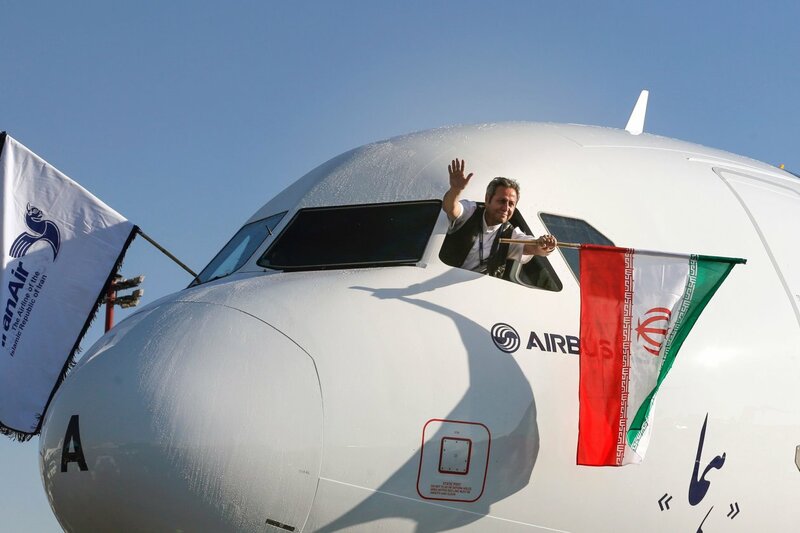 Airbus had delivered three of its 100 planes ordered by Iran Air before the U.S. decision—those planes combined are valued at around $600 million at list price. No Boeing planes have gone to Iran under contracts announced with Iran Air and Iran Aseman Airlines after the lifting of sanctions by the Obama administration in 2016. Airbus, which is subject to U.S. rules because its planes use American-made components, said it was evaluating next steps and would comply with U.S. sanctions and export control regulations. Boeing had no comment. Turboprop maker ATR, a joint venture between Airbus and Italy’s Leonardo SpA, said it had delivered eight of 20 planes Iran Air ordered for delivery between last year and this under a contract valued at around $536 million. A further 12 planes in various stages of production are now in limbo. ATR wouldn’t comment on what may happen to the planes. Though the deals carried multibillion-dollar price tags before industry standard discounts, analysts see minimal impacts on Airbus and Boeing from the U.S. decision. Both manufacturers have backlogs of orders assuring production for several years from other airlines. “The total number of orders affected represents just 2% of the companies’ combined order backlogs,” Bernstein Research said in a note. Airbus shares were about 1% lower Wednesday in Europe, trading just shy of their all-time high. Boeing shares closed 0.6% lower Tuesday and were up slightly in early New York trade Wednesday. Iranian carriers, which have limited options to go elsewhere for new planes, are seen as the biggest losers. Washington’s action “will slow down Iran’s vital re-equipage and fleet upgrade,” said Andrew Charlton, managing director of Aviation Advocacy, a Geneva-based consultancy. Iranian carriers haven’t said how they will react. Options to source planes from other makers are limited, though, because U.S. parts are incorporated by Brazilian, Canadian, Russian and Chinese plane makers. Plus, none of those manufacturers offer the full range of planes Iranian carriers seek. The U.S. government said that after a period for companies to wind down dealings with Iran that ends Aug. 6, commercial plane licenses will formally be revoked. It said it would still consider permitting the sale of plane parts to assure flight safety. Concern over the future of the nuclear deal had already weighed on airlines doing business flying to Iran. Demand for lucrative business travel softened as concerns increased that President Trump would walk away from the accord, according to airline officials. Air France-KLM SA, one of Europe’s biggest airlines, announced in May it would curtail service to Tehran because of “weak economic performance.” The flights, operated by the Franco-Dutch carriers Joon operation, will only serve the Iranian capital in the summer months and be suspended for about five months starting in late October. Etihad Airways, the flag carrier for Abu Dhabi, suspended flights to Tehran in January amid poor profitability. Emirates Airline Chairman Sheikh Ahmed bin Saeed Al Maktoum said the carrier would react to demand changes, without signaling if the airline, the world’s largest by international traffic, would adjust its flights to Iran. Car makers and oil companies, such as Total SA and Royal Dutch Shell PLC, are among other businesses that courted deals in Iran. Shell said it was assessing the impact of the executive order. Total declined to comment after the announcement. There are risks in doing business with a terrorist nation.